Hello everyone from Change In Our Lifetime! We have taken a brief break to work on our infrastructure, and we have created the bones of a long-term organization with a few staff people who are talented and committed to what we are trying to accomplish. We are back better than ever! Yesterday was Women’s Equality Day, a celebration of the day women were granted the right to vote and the 19th amendment went into effect. 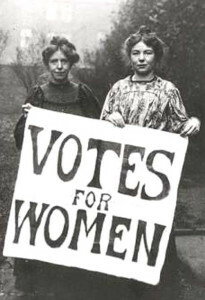 It should really be called Women’s Get the Right To Vote Day. We have not achieved equality. Names like this allow us to rest on our laurels, allow us to sound like we are equal when we are not. Recently, I was having a conversation and when I mentioned what is CIOL, the person said “We have come so far – isn’t that enough”? I thought about it for a split second – if that, and I said “No, not really”. Watching events unfold in the last few months, I am struck by history repeating itself. Women’s freedoms continue to be under attack. Sexual harassment is still front page news. And to me, it seems kind of quiet out there. Not enough outrage, not enough participating, not enough sustained action. If women want their legislators to listen to them, they need to get in the game. Elected officials these days seem to have forgotten that they have been elected and are supposed to listen to their constituents. Allowing our elected officials, on any level, to behave in a way that is counter to what is right for women is not acceptable. Fighting back at the time legislation is to be passed or after the fact is too late. Not speaking up about inappropriate behavior at work hurts not only ourselves but also other women – I know, personally. Action is the only thing that speaks loudly. Women need to run for office. Women need to speak up and speak out. It needs to matter that we are not moving ahead fast enough and in some cases at all. Women need to economically effect change by voting with their dollars – supporting candidates who support them, shopping with companies who support them, and being unwilling to accept inappropriate behavior and language. We need to act like we really want Change. Most importantly, we need to decide if we really want change. That equality is not just a buzz word – a topic of conversation for lunch and then put aside for another day. It matters how we act, what we say and anytime we allow the impression that we are equal it is like taking two steps back. Let’s celebrate Happy We Got The Right To Vote Day – On August 26. ‹ How would you answer?